Its going to be a dry day, they said. 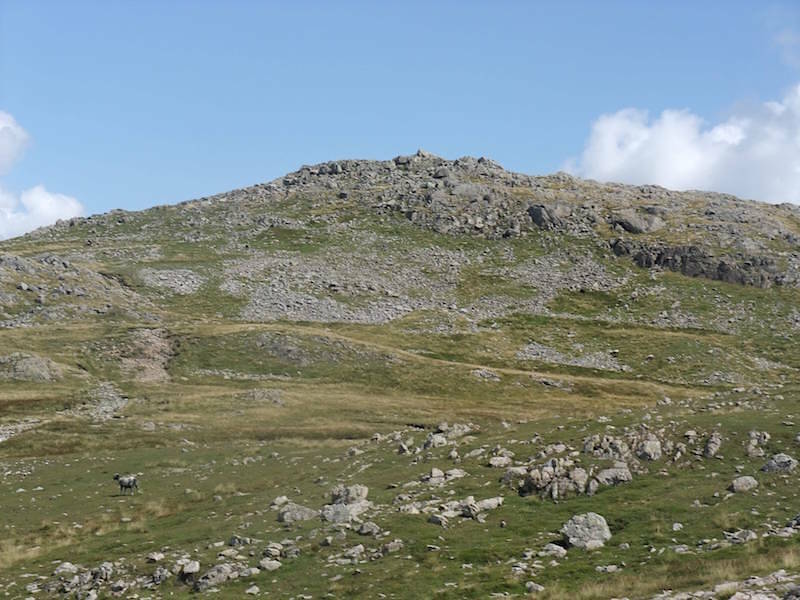 OK, we said, let’s go and walk up Wetherlam. 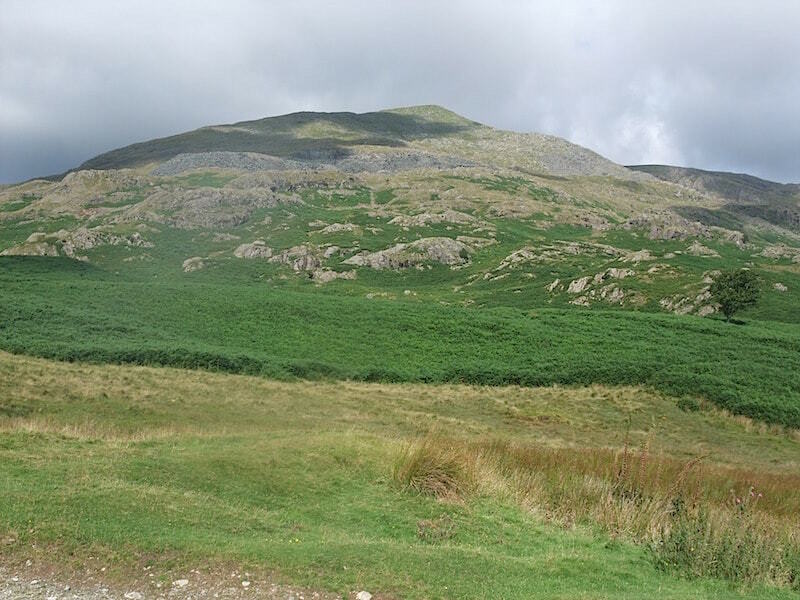 So here we are looking towards Coniston Old Man from the Walna Scar road parking area. Of course we’re not going up there, I just thought I’d take a photo of it while I was waiting. 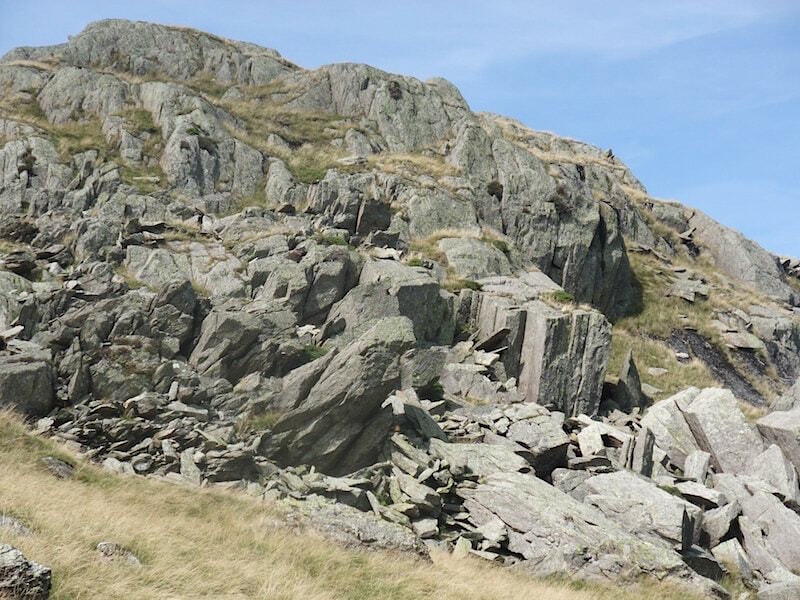 A panorama of fells from the parking area, with Wetherlam towards the right skyline, and Swirl How, in shadow, towards the left. 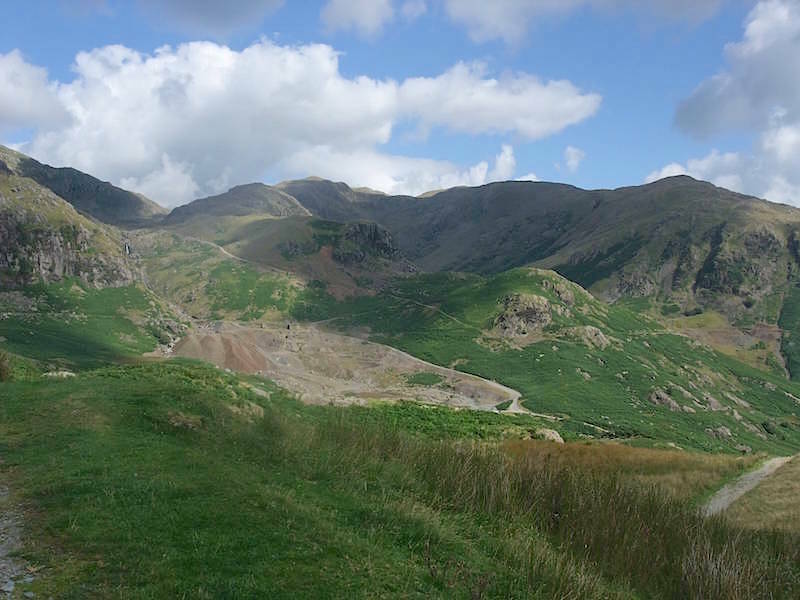 Looking towards the quarry below Wetherlam as we make our way along the path from the car park. 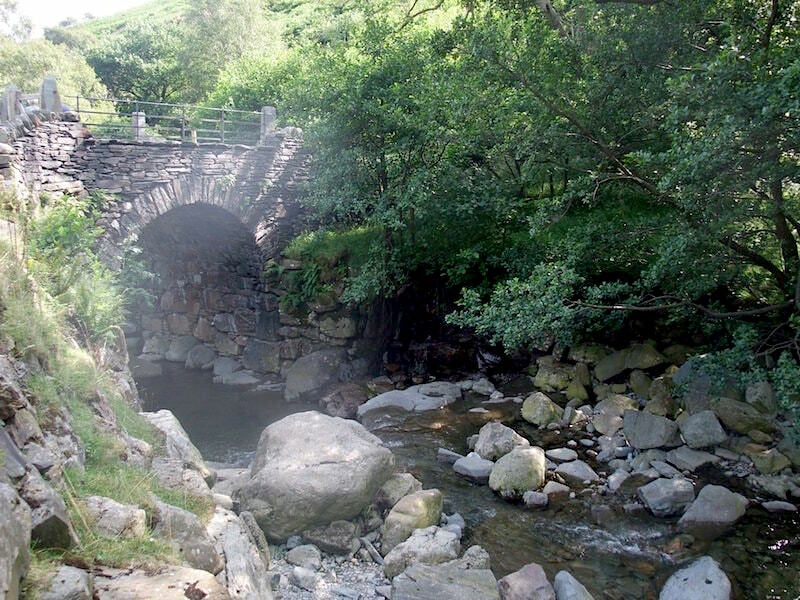 It seemed to take ages to get here but we finally reach the footbridge over Levers Water Beck. 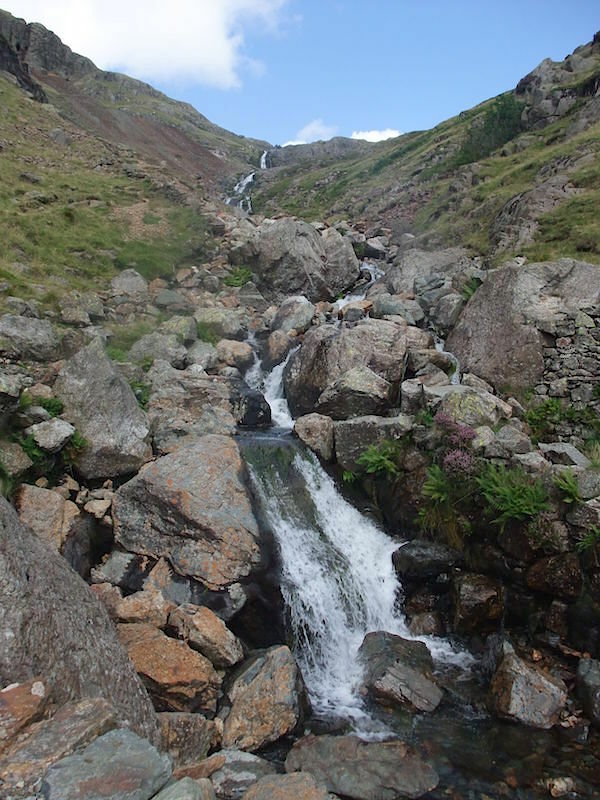 Cascades tumbling down the beck between Grey Crag and Kennel Crag. 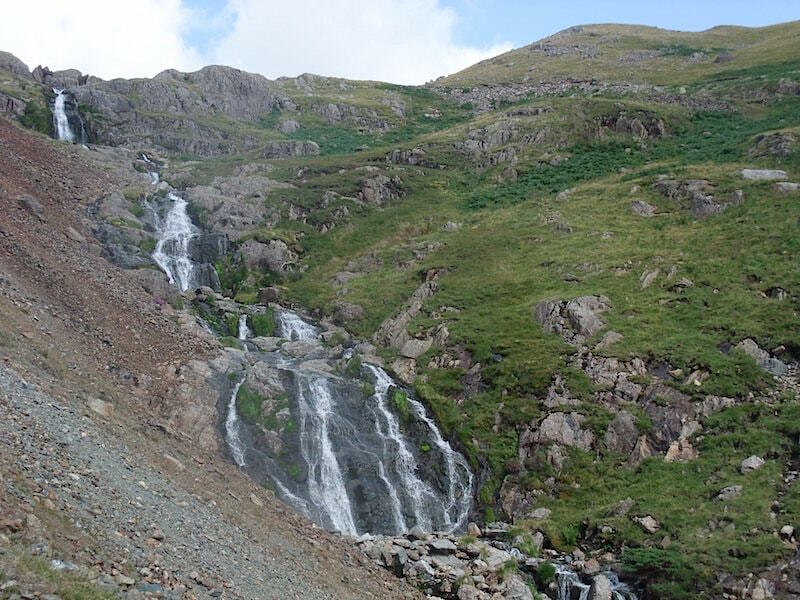 Levers Water cascades. There is a perfectly good path over to the right but no, we had to walk up the rough one. 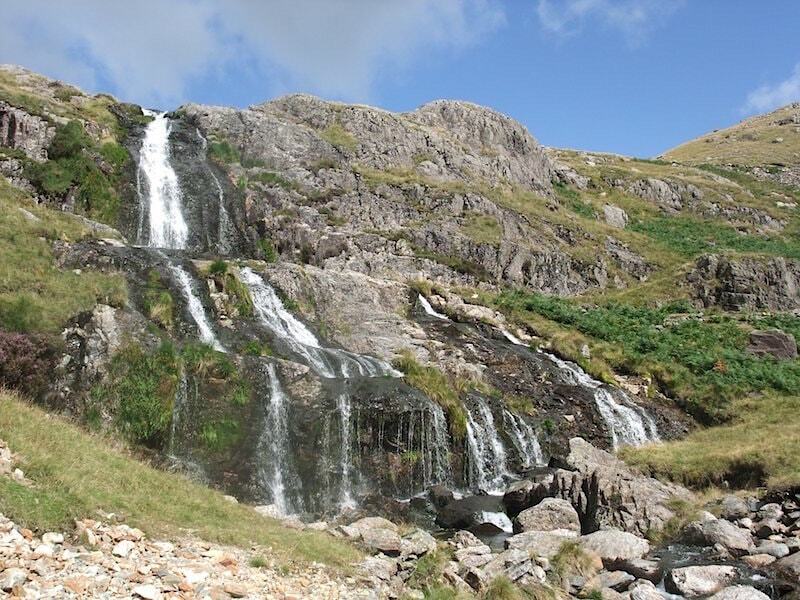 However, the view of the waterfalls compensated for the roughness and steepness of the path. The water is flowing out of …..
….. Levers Water. 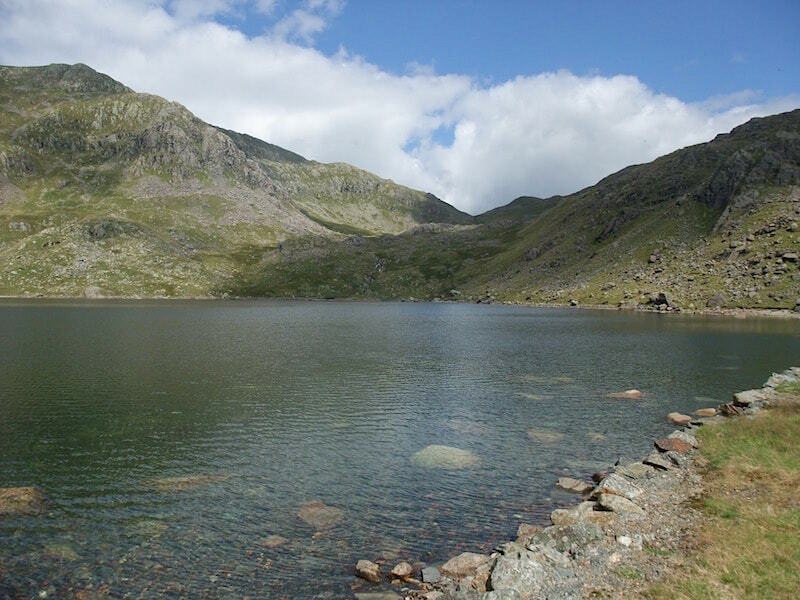 Its a natural tarn, but it was enlarged by a dam in 1717 to provide water and power to the copper mines in the valley below. 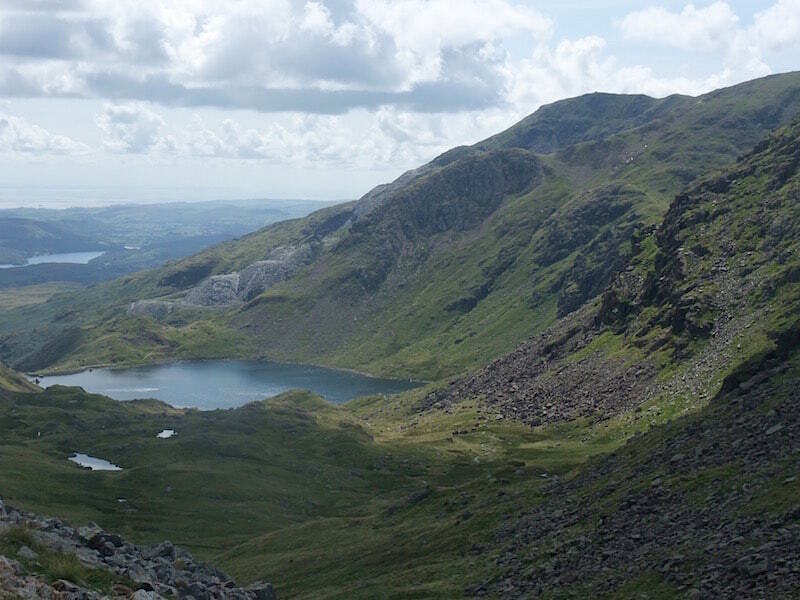 Coniston Old Man is in shadow over on the top left. 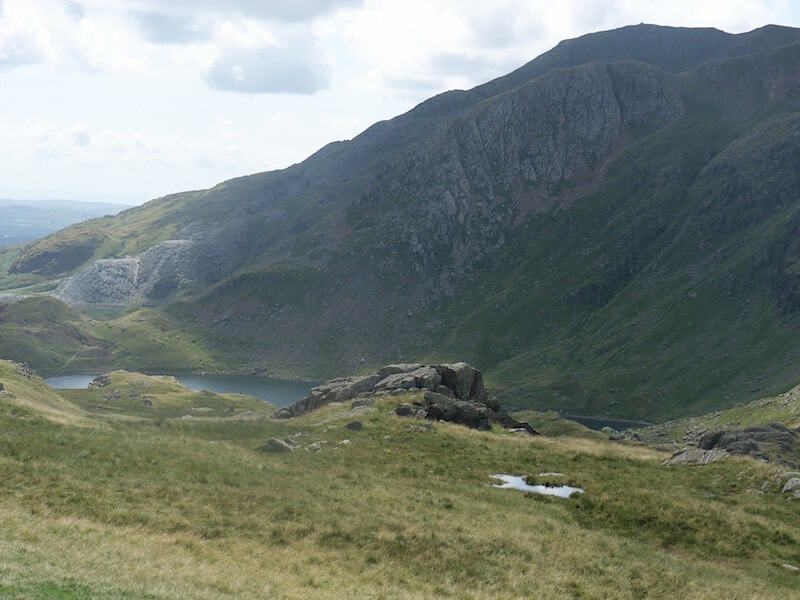 Swirl How from Levers Water. Swirl How on the left sloping down to Swirl Hause, which is the low point on the skyline. A closer look at Swirl Hause. 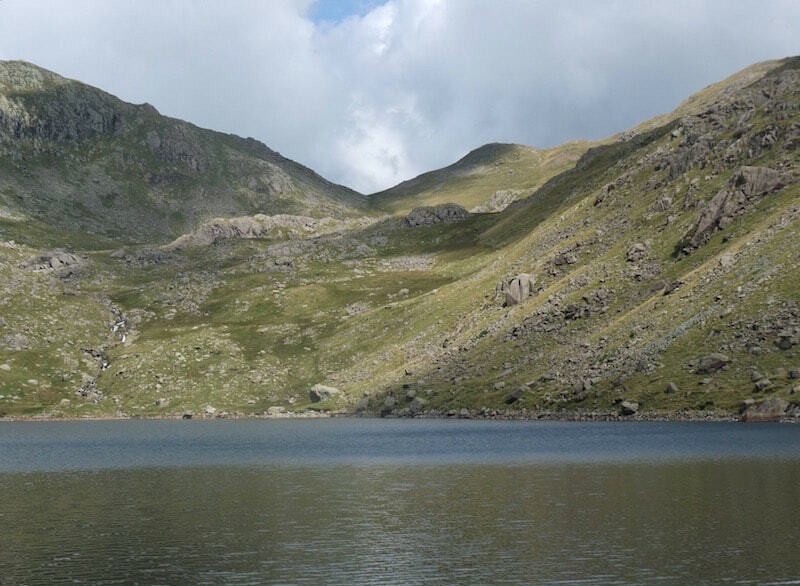 We’ll be walking around the tarn and then following the path up to the hause. 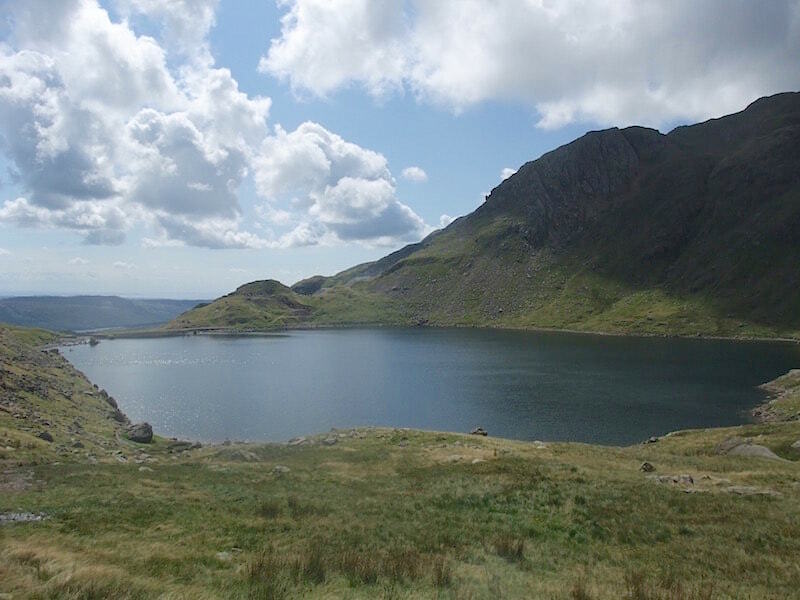 The view across Levers Water as we pick up the path to Swirl Hause. 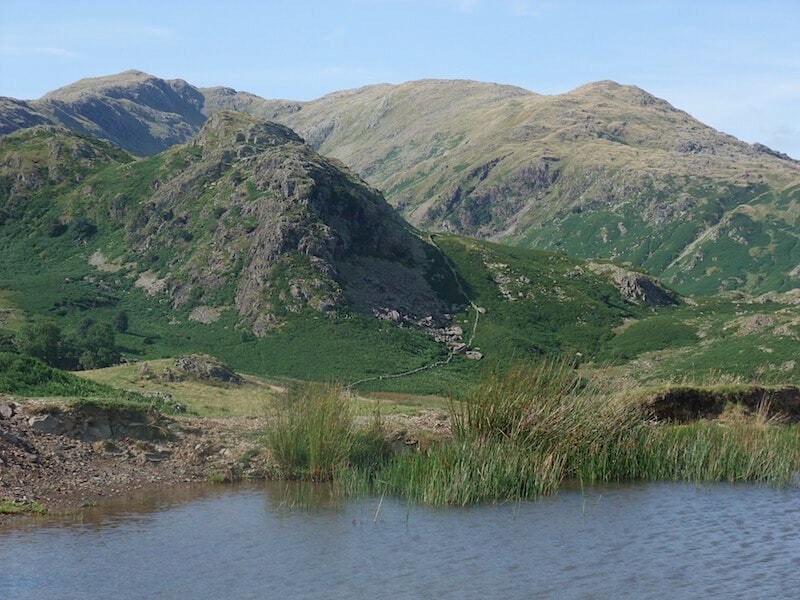 We pass these two un-named tarns as we walk the path above Levers Water. 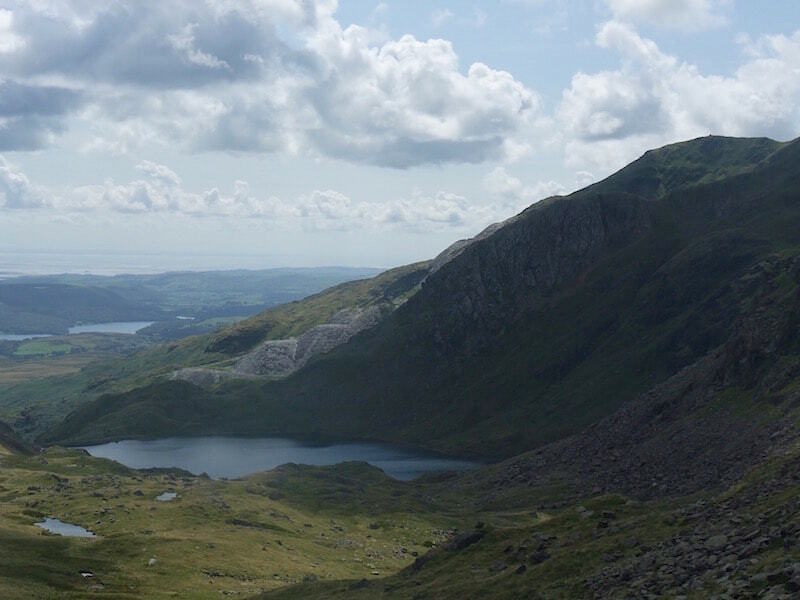 A look over at Coniston Old Man from the path above Levers Water. 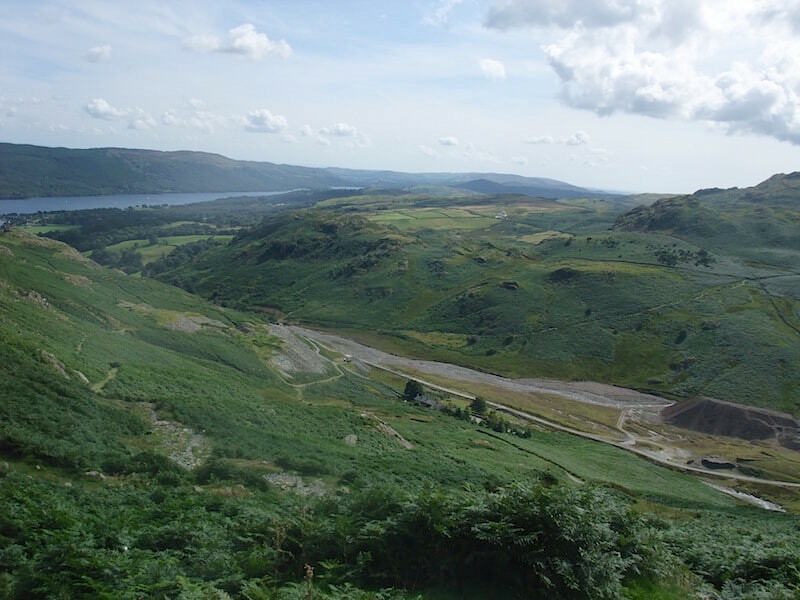 Looking down on Levers Water and Coniston Water beyond. 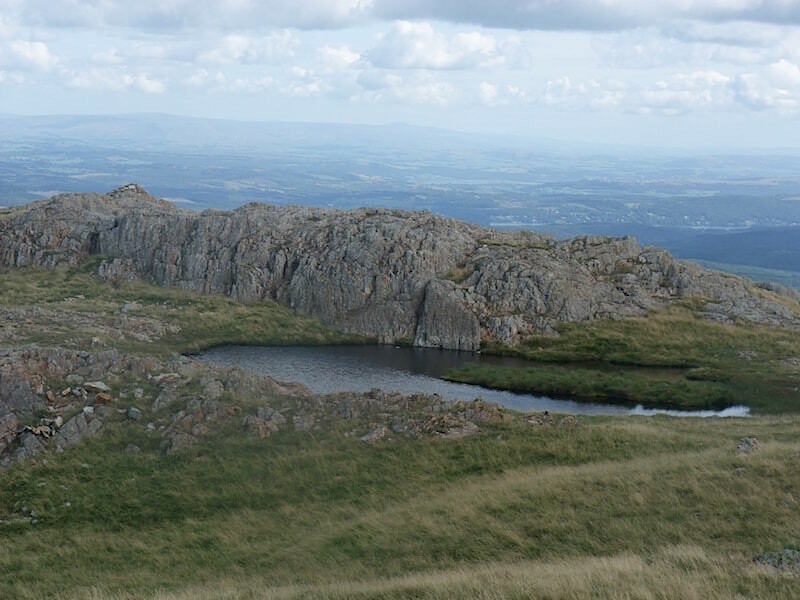 The two un-named tarns are there as well. 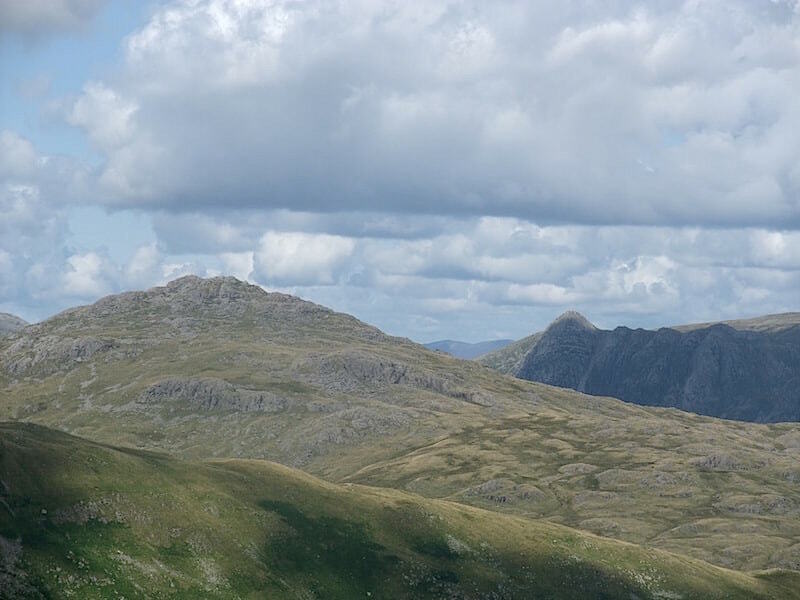 A view of Great Carrs from Swirl Hause. It was a bit tedious getting up here as there were lots of squelchy areas along the way. 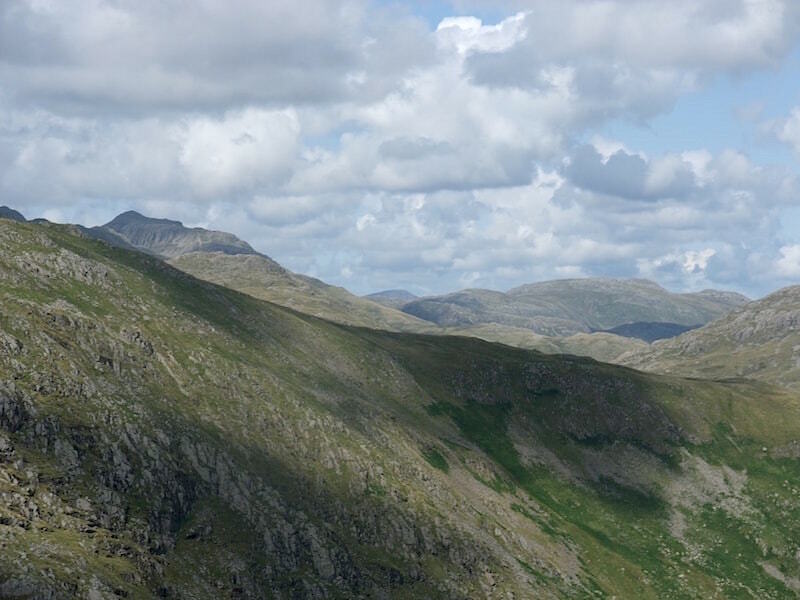 Bowfell, on the left of the skyline, from Swirl Hause. 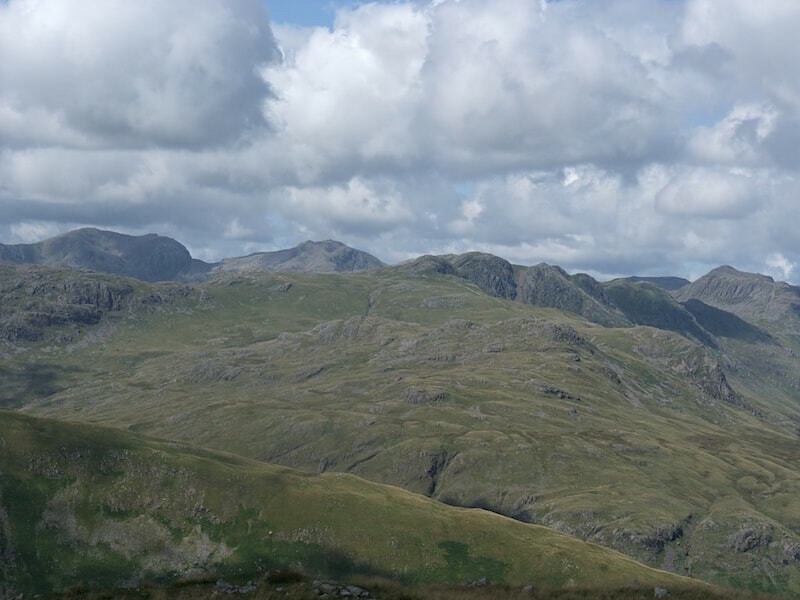 Also from Swirl Hause, Pike O’ Blisco on the left and the Langdale Pikes on the right. 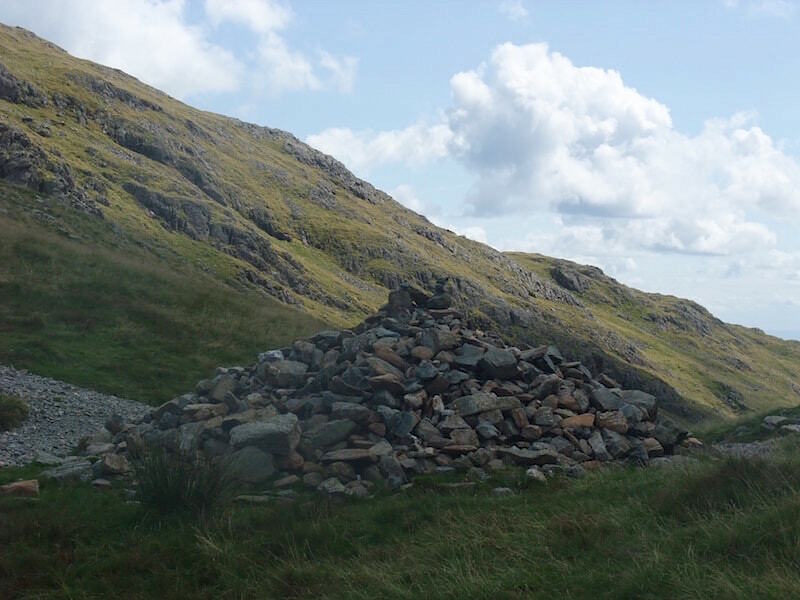 The big cairn at Swirl Hause. 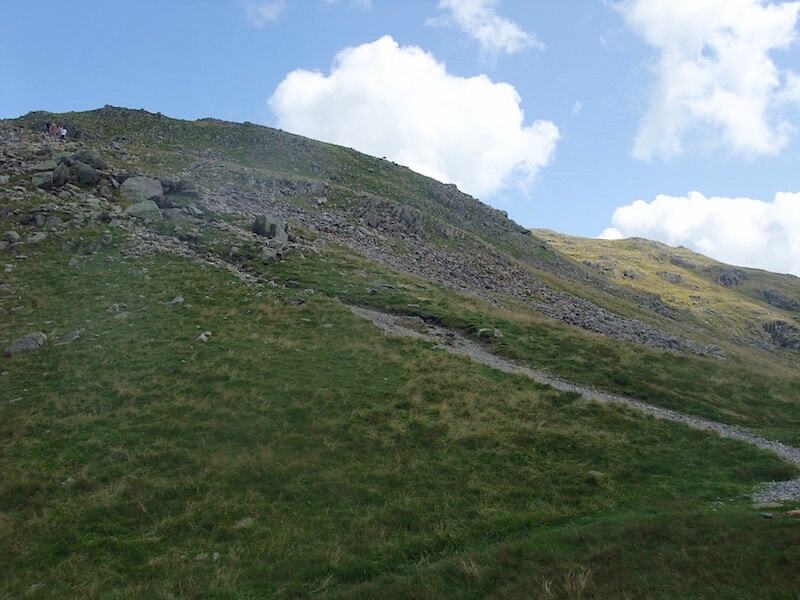 The path to Wetherlam from Swirl Hause. 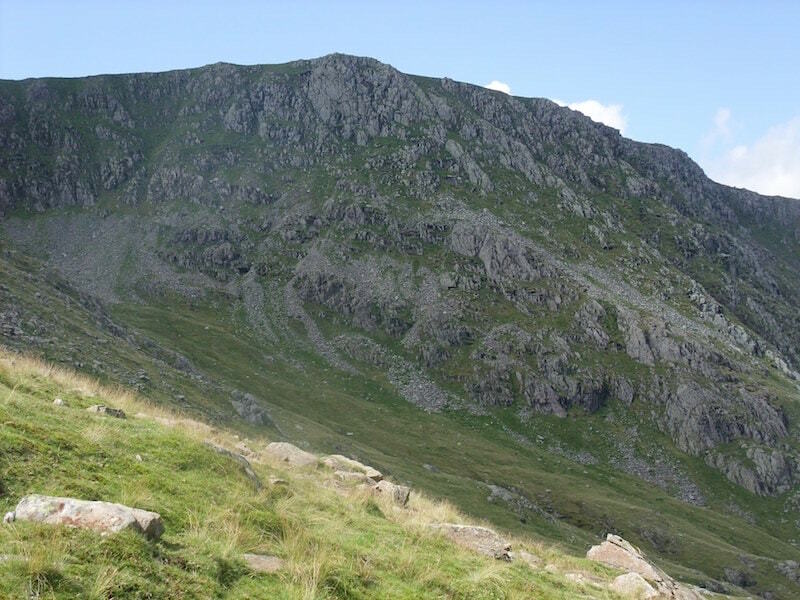 A group of walkers up at the top left cautiously making their way down. 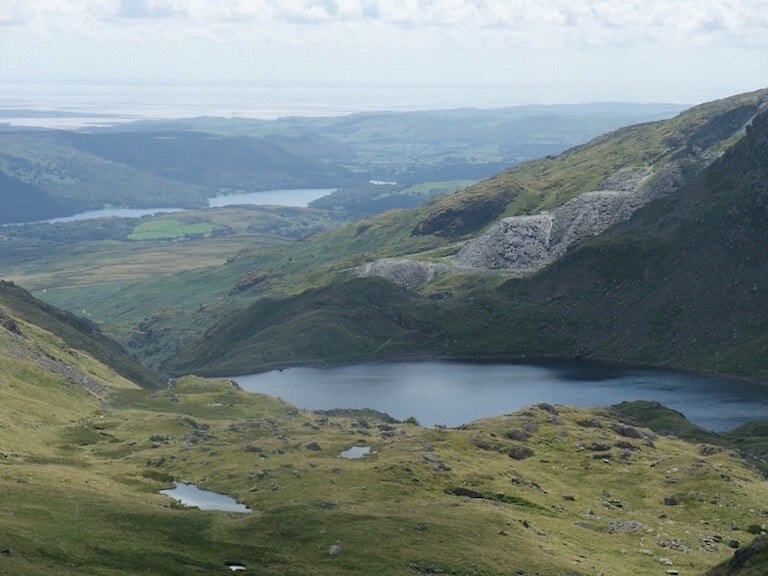 A fine day, Coniston Water, Levers Water, two nameless tarns, a mine with spoil heaps, and Coniston Old Man, what more could you want? Well, how about a stop for a breather? Looking across to the path up to Swirl How from the path to Wetherlam. The group below had just descended the path we are now on and they stopped for a while at the cairn. 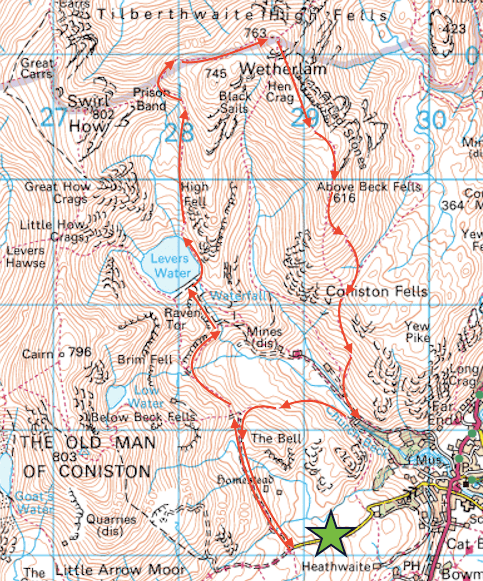 No doubt to help their legs get back to normal before going on up the path to Swirl Hause. 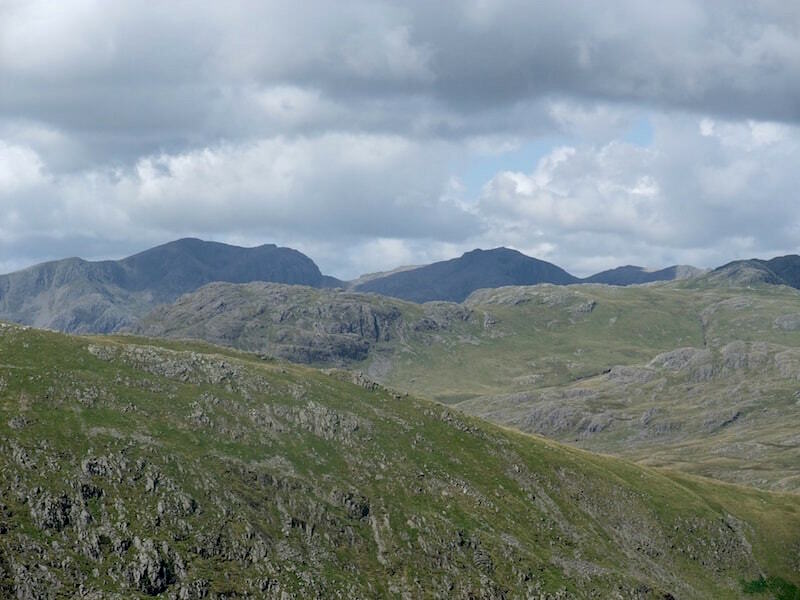 The two high fells in shadow on the skyline are Scafell, on the left, and Scafell Pike to the right of it. 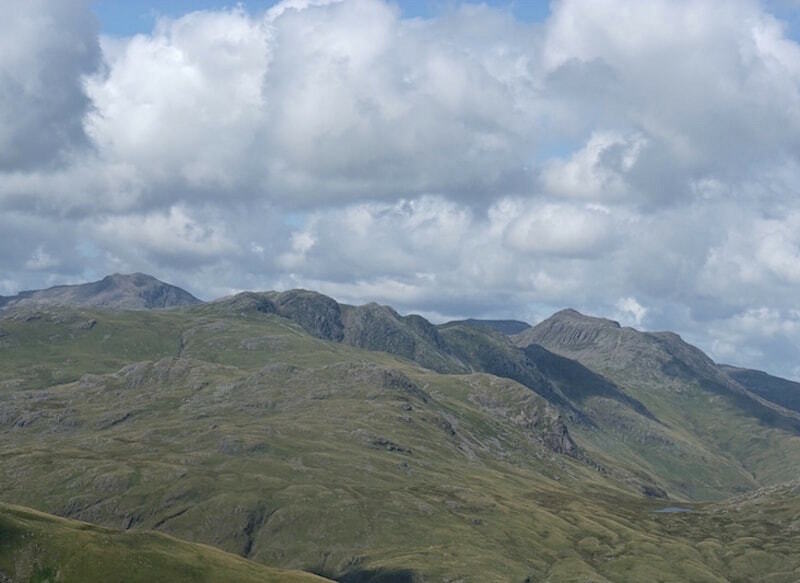 Looking across Cold Pike to Crinkle Crags and Bowfell. 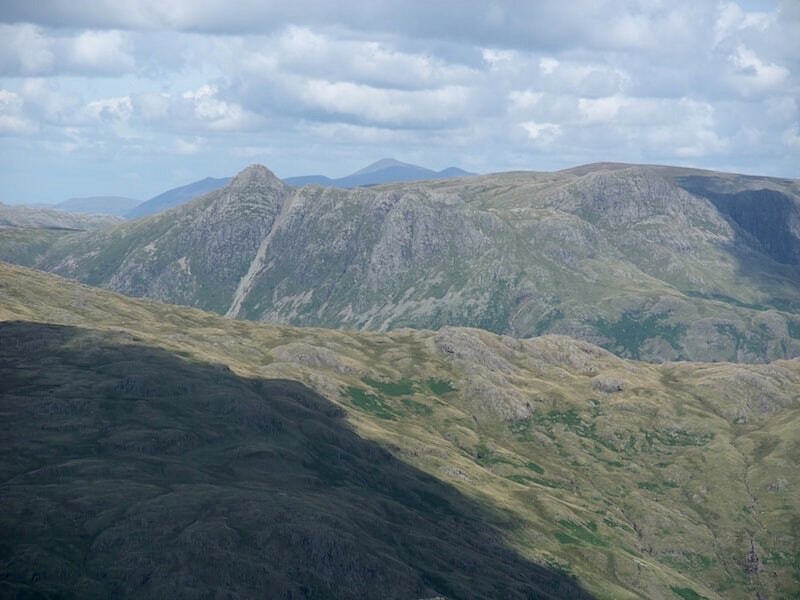 Over on the left Bowfell is in the shade behind Cold Pike with Pike O’ Blisco, in the sunshine, on the right. 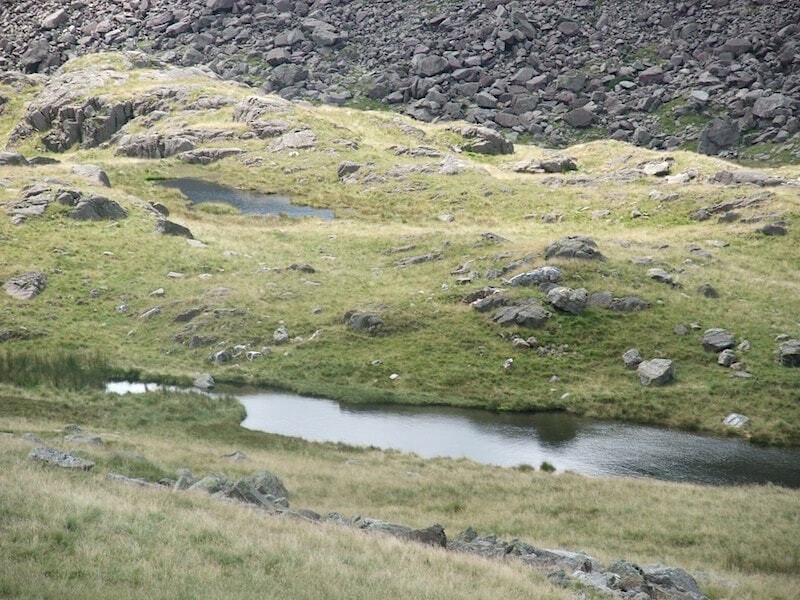 The small patch of blue you can see between them is Red Tarn. 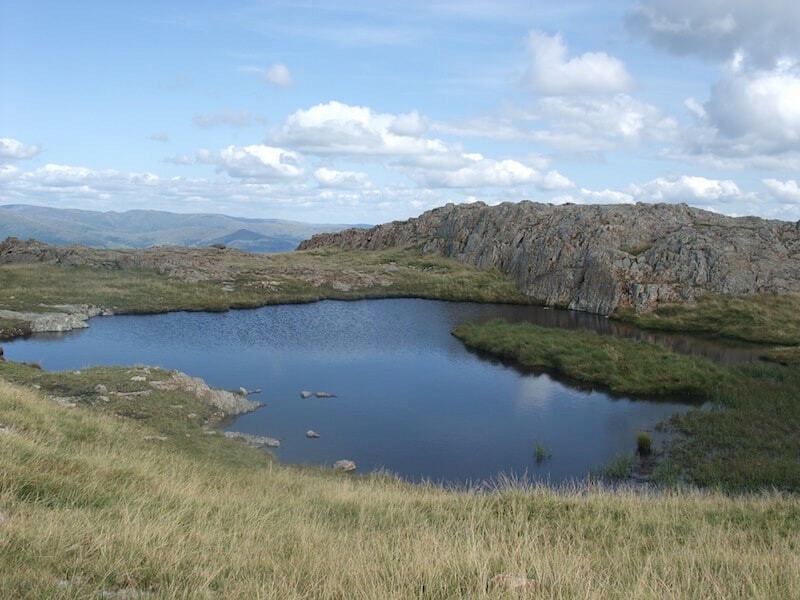 The tarn gets its name from the red colour of the rocks which are in it, the redness coming from the iron content inside them. 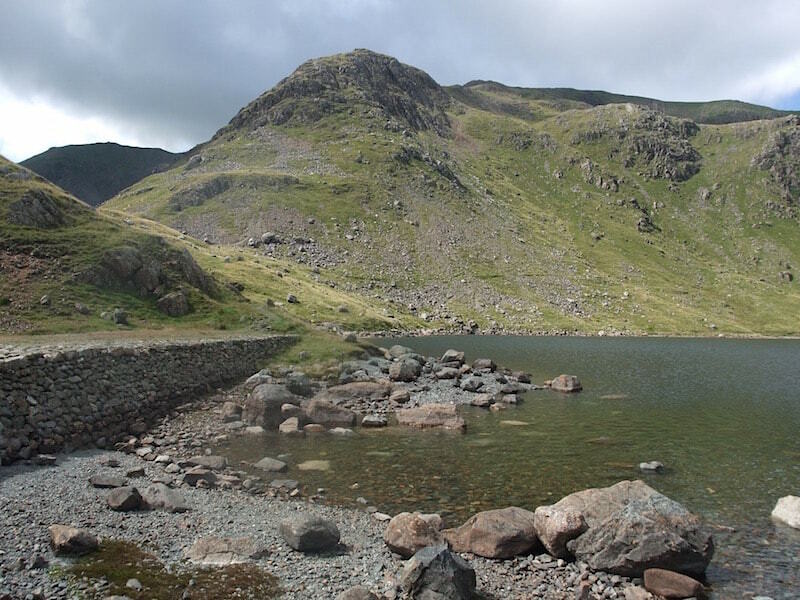 The unmistakeable rounded dome of Pike O’Stickle, one of the Langdale Pikes. 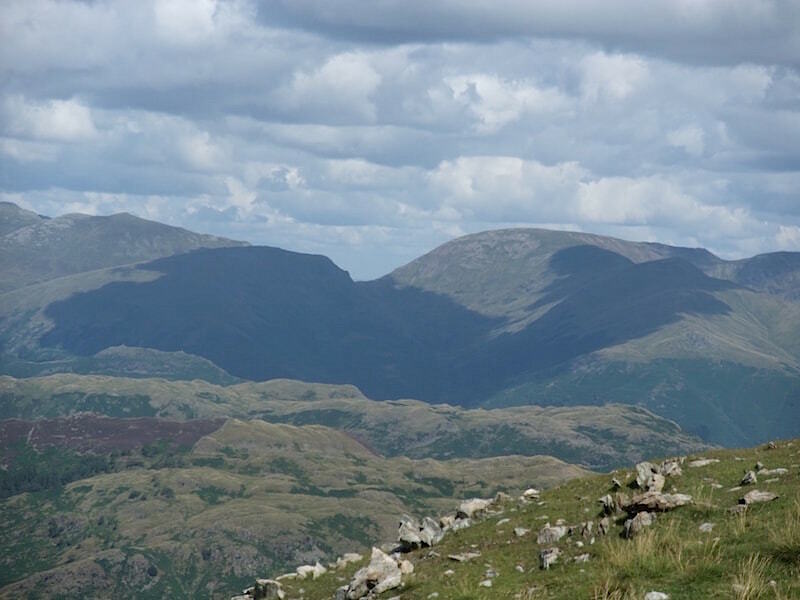 Looking north eastwards to the Fairfield group of fells over on the right, and the beginning of the Helvellyn range over on the left. 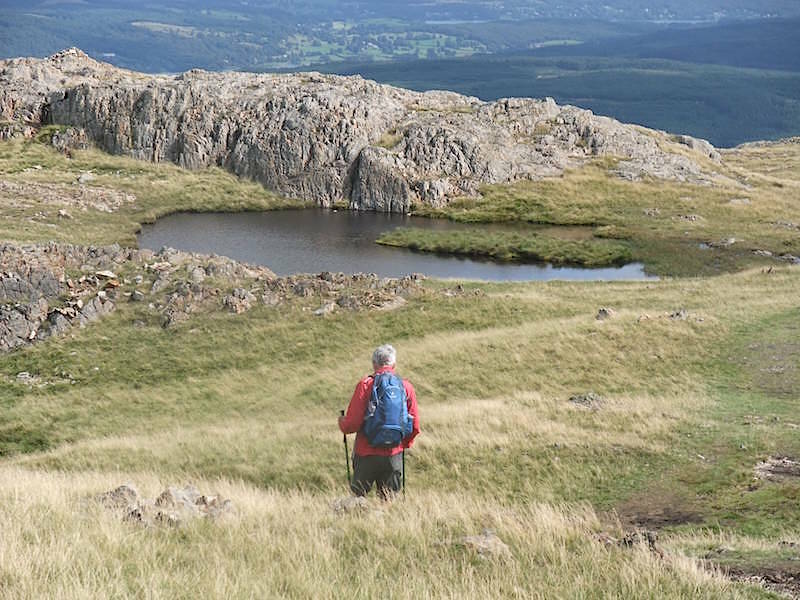 The summit of Wetherlam comes into view at last. 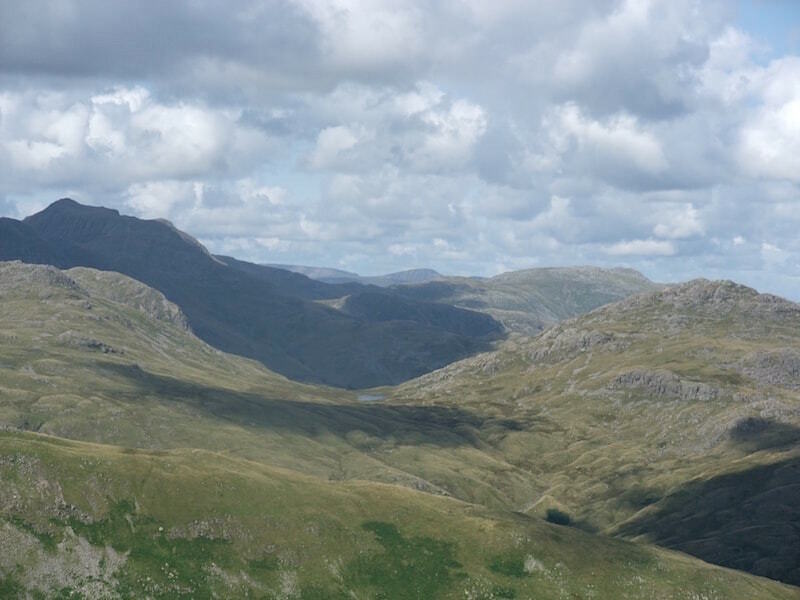 From Wetherlam a look across Cold Pike to the Scafells, Crinkle Crags and Bowfell. 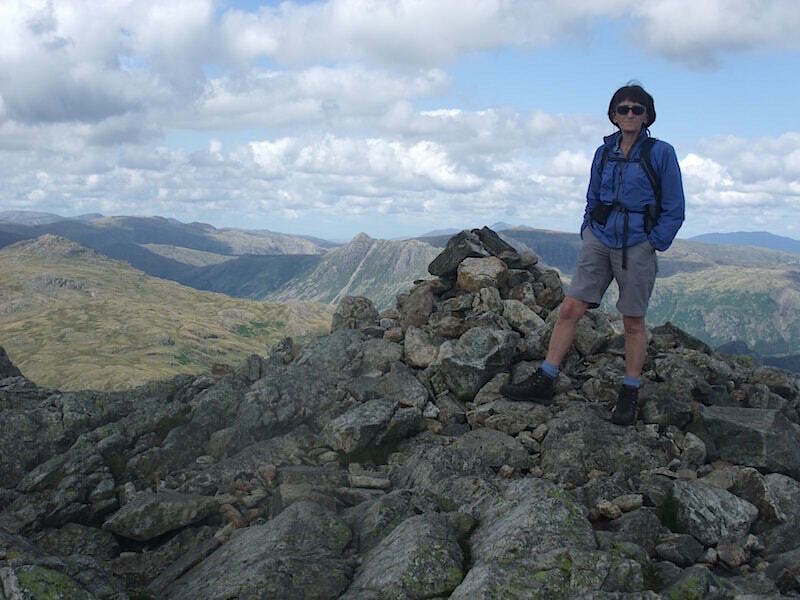 A closer look at Scafell Pike, Crinkle Crags and Bowfell from the summit area on Wetherlam. 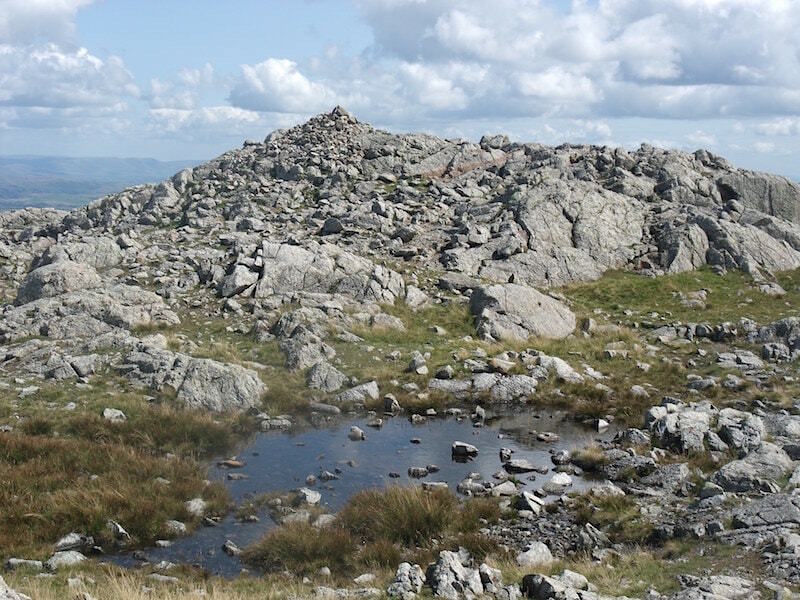 Wetherlam summit cairn and a very small tarn, or maybe its just a big puddle. It was a fine sunny day but there was a bit of a nip to the breeze, that’s why the windproof is still on. 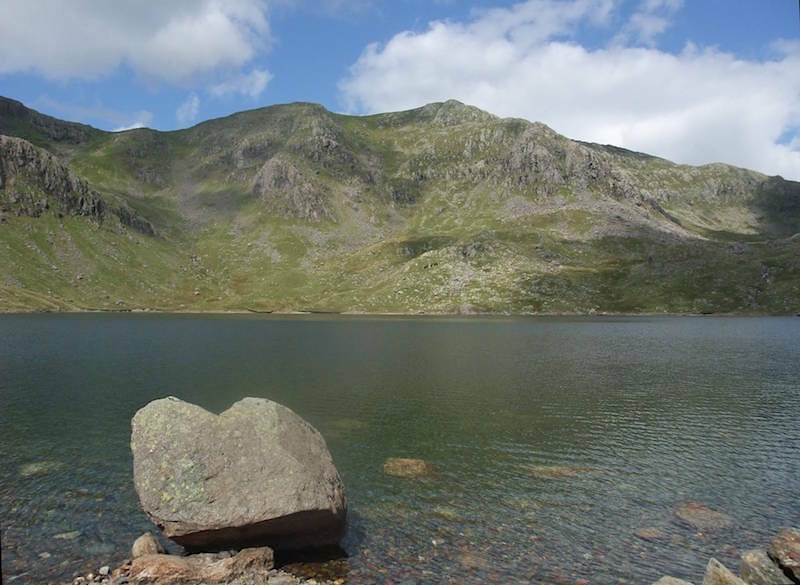 We passed by some tarns, not named on the map, on the way down Wetherlam’s south ridge. 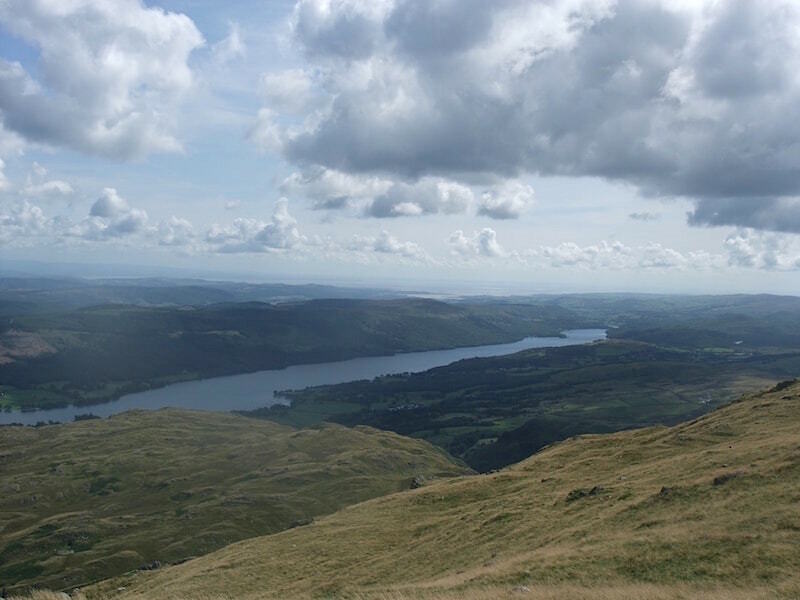 A view of Coniston Water as we continue down the south ridge. We passed these very large rock formations on the way down the south ridge. 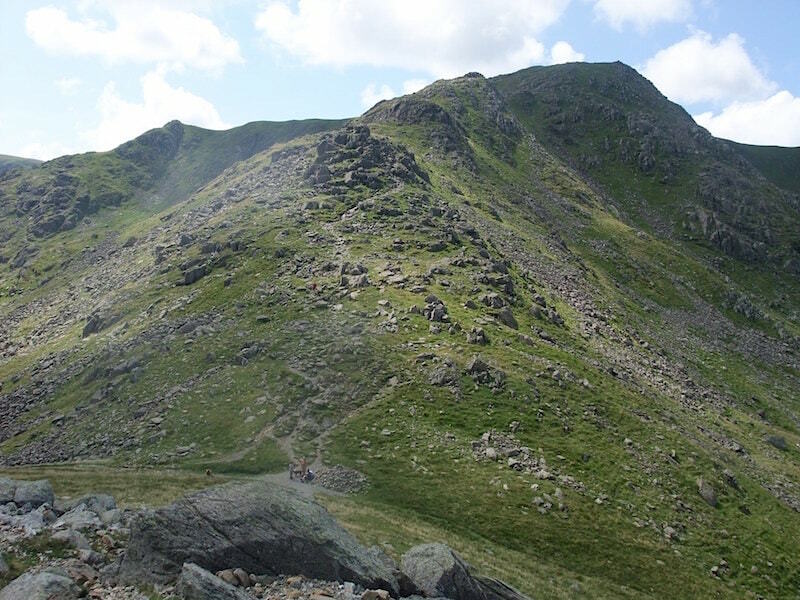 Perfect for a bit of scrambling practice. 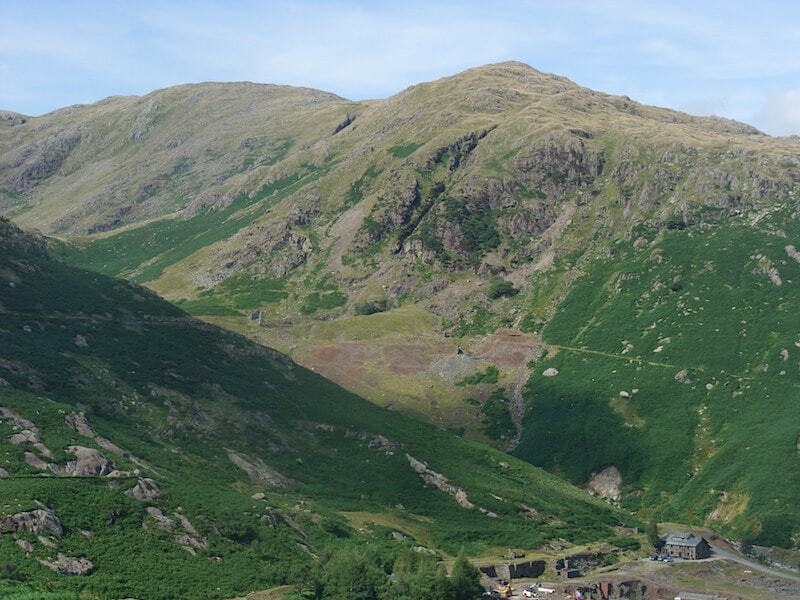 The Coppermines valley with Coniston Water beyond. 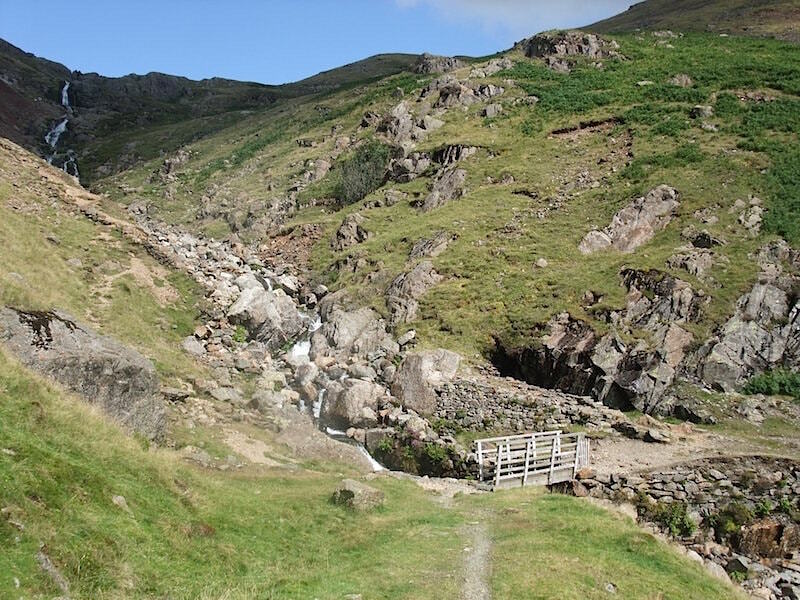 When we get down there we’ll cross the beck at the Miner’s Bridge and then take the path which you can see rising through the bracken on the hillside opposite.That will lead us back to the car park, which is the little whitish area in the sunlit fields in the distance. Miner’s Bridge. This was the best shot I could get as there were quite a lot of people here today. 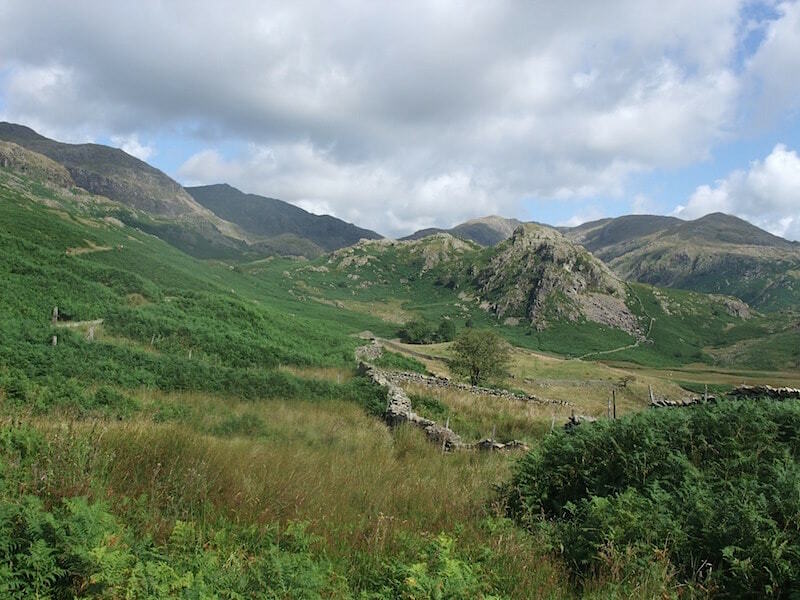 A look back at Wetherlam as we fight our way through the bracken on the hillside path. 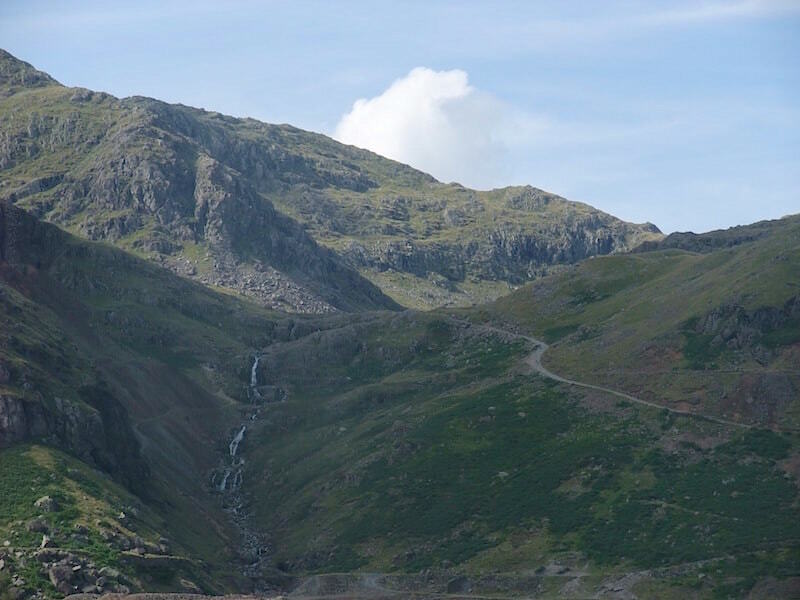 Looking over at the Levers Water Beck route we took earlier, there’s the easier path on the right, but of course you don’t get such a good view of the falls and the cascades if you take that one. A case of swings and roundabouts I suppose. 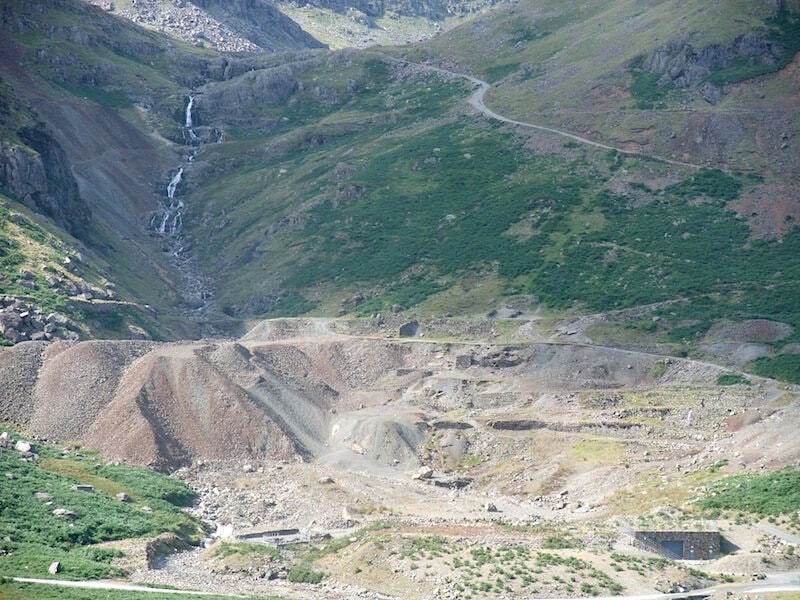 Levers Water Beck and the cascades above the quarry. 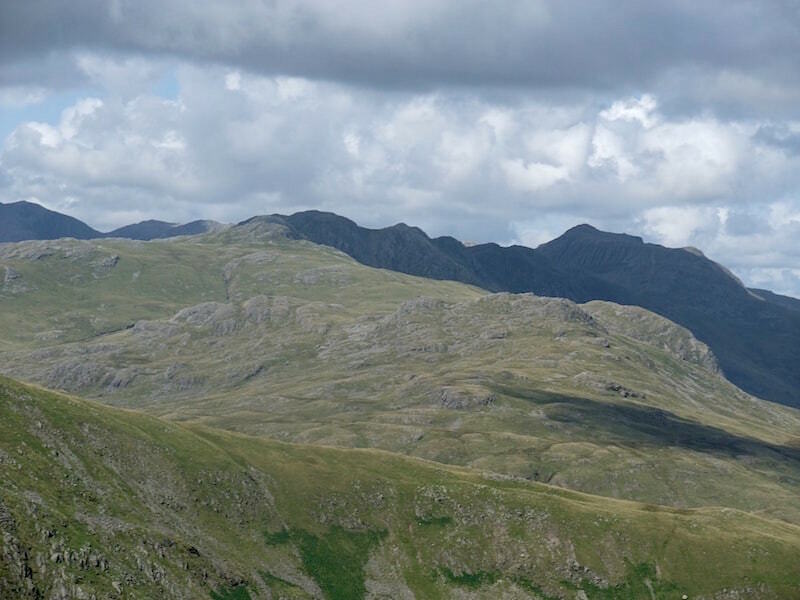 Finally, The Bell, in the middle foreground, with Wetherlam behind it from the Walna Scar parking area.